San Francisco: Parents of teenagers will hate hearing this. So will corporate auditors, preachers, tax accountants and federal prosecutors. But sometimes - just sometimes - a person has to break the rules if they want to succeed. The Chrysler group had a couple of rules in place for years that were followed with a religious fervor: One, the Dodge brand is supposed to be sporty and performance-oriented. And two, the company's rugged, all-American Jeeps, which are engineered to cross the Rubicon Trail, can't share their platforms with any other brands. While these rules kept the Dodge and Jeep brands relatively intact, they also had an unintended consequence. Dodge was left with just one SUV in its lineup - the Durango - while virtually every other brand in the world added SUVs like they were gold chains in a rap video. Even when Mercedes-Benz, Lexus and Porsche figured out that SUVs were more than a fad, poor Dodge was left with one piddling 4x4 as recently as 2006. 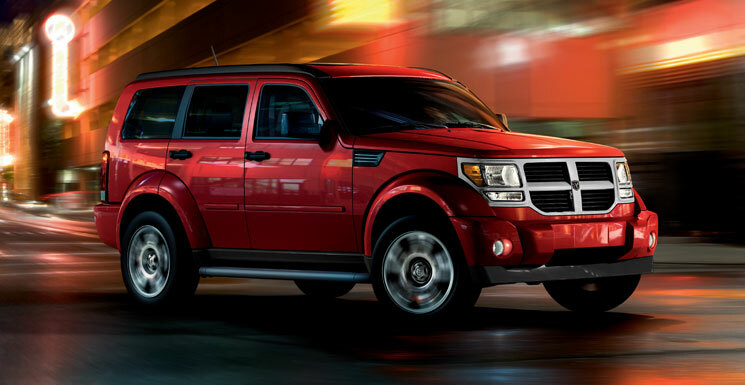 Then came the Dodge Nitro. Like a classic James Dean character, it comes onto the scene as Chrysler's bad boy, the SUV that breaks all the rules. For one, it shows that Dodge is giving up its pretension of being "sporty," because SUVs are about as far from sports cars as you can get. And two, it's the first vehicle to blatantly steal from the cathedral of Jeep. The Nitro is essentially a Jeep Liberty stretched four inches and fitted with a boxy body. Some would say the Nitro, with its militarized, Hummer-like shape, looks even more like a Jeep than the cute Liberty. Not surprisingly, it also drives exactly like a Jeep, with a bouncy, firm ride, high seating position and heavy feel. I had a hard time remembering the Nitro's brand. Whenever someone would ask me about it, I'd think, "It's not a Jeep ... it's not a Jeep.... it's not a Jeep ... what is this thing again? ... Oh yeah ... a Dodge." If my wife asked which car I was taking to the store, I'd always blurt out "The Jeep." But the Nitro is a Dodge, and a darned good one at that. It looks fantastic, so it'll probably find plenty of buyers based on the body alone. It drives just as nicely as its tried-and-true Jeep sibling, and its got off-road credentials to boot. Also, because it's longer than the Liberty, it's a bit more practical, too. It has a huge cargo area with a cool feature called the "Load 'n Go Floor." Basically, the cargo floor is like a huge shelf that can slide forward and then back again, making it easier to load with big boxes. It also has some innovative entertainment options. Yes, its stereo can play MP3 discs, and an optional upgrade includes a 20-gigabyte hard drive for storing music and photos, all of which are available via a touch-screen control and via voice commands. Two nice V6 engines are offered: a 3.7liter that makes 210 horsepower, and a 4.0-liter that cranks out 260 horses. Personally, I'd choose the smaller engine because it's smoother and more efficient, but the bigger V6 is better for lead-foot acceleration and some light-duty towing. On the downside, the Nitro suffers from the same cheap-feeling interior parts as the Liberty. It looks nice enough, but when you run your hands across the dash and over all the buttons, it feels hollow and fragile, which isn't the sensation you want to get from a new car. It should feel solid, like it will last for decades in the sun, but instead it feels like something you'd buy in the clearance toy bin at Dollar General. Nonetheless, I bet the Nitro will be another big hit for Dodge, which is already the Chrysler group's best-selling brand. It drives well, looks fantastic and is practical and comfortable. And it only exists because someone at Chrysler decided to break the rules. What was tested? The 2007 Dodge Nitro SLT 4x4 with a base price of $24,145. Options included: Performance tires ($100). Price as tested including a $660 destination charge: $24,945. Maybe Hummer should get their trademark lawyers on the phone. The new Dodge Nitro has a boxy, militarized stance not unlike the small Hummers for sale today. Why avoid it? Parts of the interior feel cheap and flimsy, and neither of the V6 engines get particularly great gas mileage. Like its sibling, the Jeep Liberty, the Nitro has an interior that looks good but feels cheap. It's more practical and innovative than the Liberty, though, with several entertainment and storage features that aren't available on other vehicles.